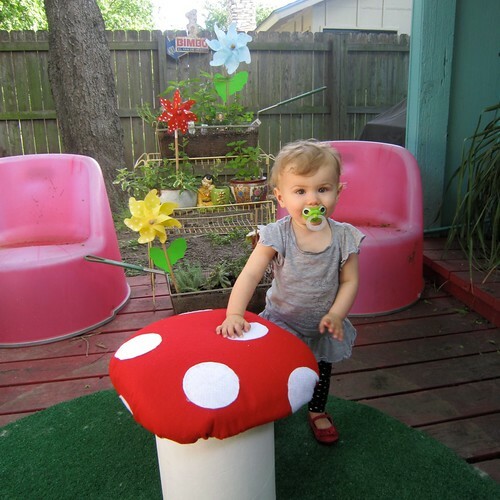 With spring in the air everyone needs a polka dotted mushroom stool in their garden or on their patio. You could buy one from your local garden center or you could easily make one like I did. Actually I didn’t do any dumpster diving. What I did do was cruise my neighborhood during bulk trash week. 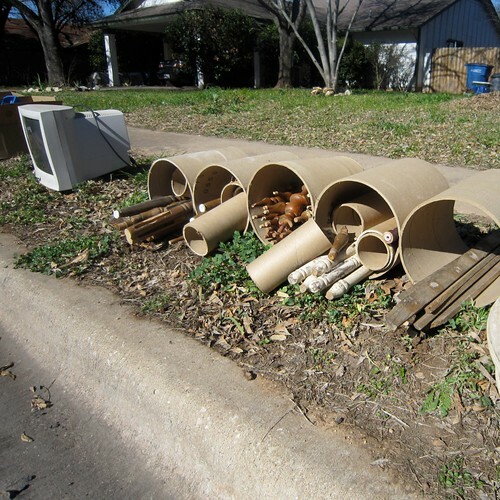 On a nearby street I found several large cardboard tubes which I was later informed are concrete pier forms. They were also filled with lots of wooden dowels that I snagged. I covered the cardboard in 2 coats of white paint. 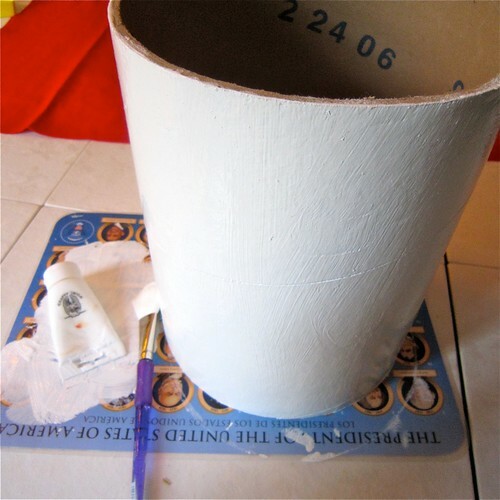 Using a mug as my template I traced 12 circles onto white felt. 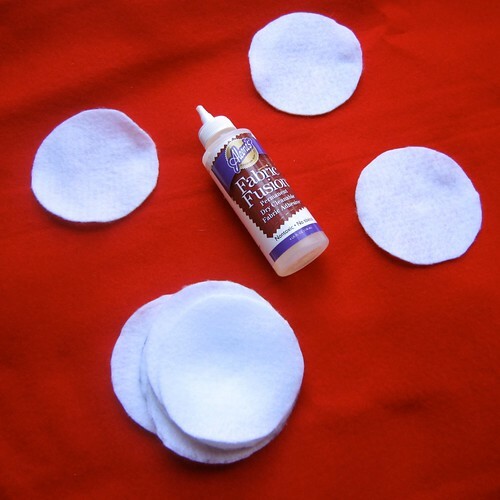 I then cut the circles out and used Liquid Fusion Glue to attach them to a piece of red felt. 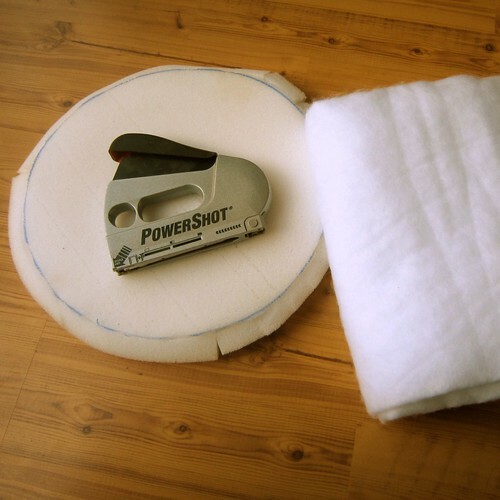 I traced my wooden disc onto foam and cut it out with scissors. If your foam is super thick you may need to use an electric knife. 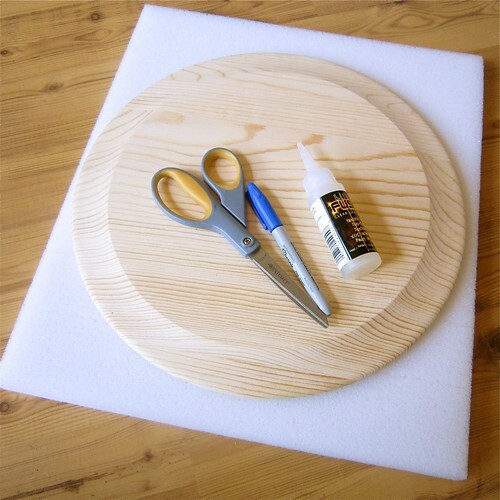 I glued my foam to the wood using Liquid Fusion Glue. I also padded my stool with some extra batting. Once the glue dried on my foam I sat it face down on the non-polka dotted side of my red felt. 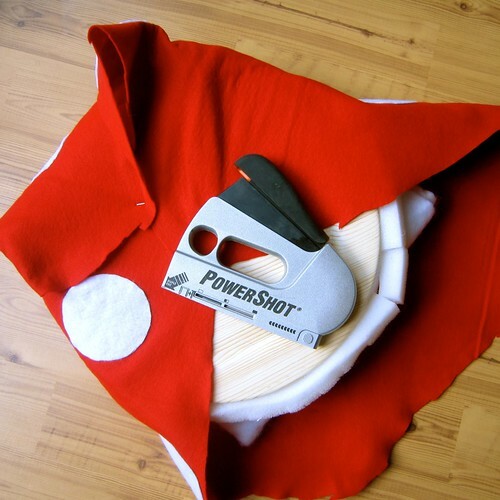 Using my staple gun and scissors I pulled, tucked, stapled and trimmed the felt. I tried to make sure the felt did not pucker and was nice and taunt on the top of the cushion. 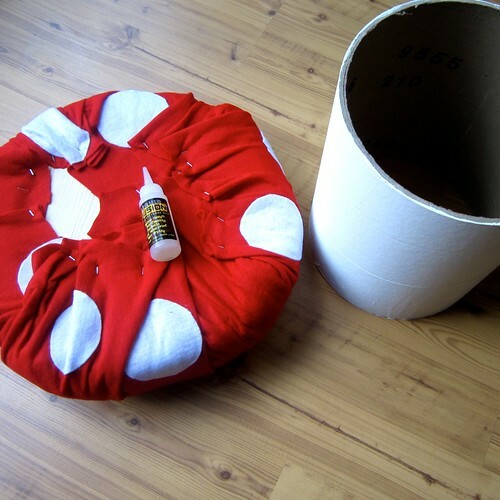 I used a heaping helping of Liquid Fusion glue to attach my stool top to it’s base. Though my stool is not water proof on a sunny day it looks pretty dang cute sitting on my back porch just waiting for someone to pop a squat. When someone is not sitting on my new polka dotted mushroom stool Tallulah enjoys playing with it. Next I need to make a giant paper mache garden gnome. Posted April 22, 2010 & filed under Crafts, Gardening, Home Decorating, I Love to Create, Kids, Plant Crafts. I love this! Score on the 'dumpster dive'!! I also love those big pink chainrs in the background. Luv luv! The pink chairs used to be pink, but alas the sun and pinkened them. I keep meaning to pour cement in them and use them as molds to make new chairs. Super cute! But uh, who's that kid? Can't be Tallulah. Tallulah is a baby, not a tall kid like that! Jeez she's growing! Both toadstool and child are gorgeous. I know right, I was pretty excited for the score. I have not quite decided what to do with the other molds (I have about 3 more) and the dowels. I'll keep you posted. Adrienne Breaux – yup that is T-Boz. She is 14 months today walking and babbling like a real toddler. Jennifer: That is absolutely darling and so is the little model. I had a mushroom stool in high school. It was bright orange and fuzzy all over. Ofcourse, that was nearly 40 years ago. Wonder what happened to it? 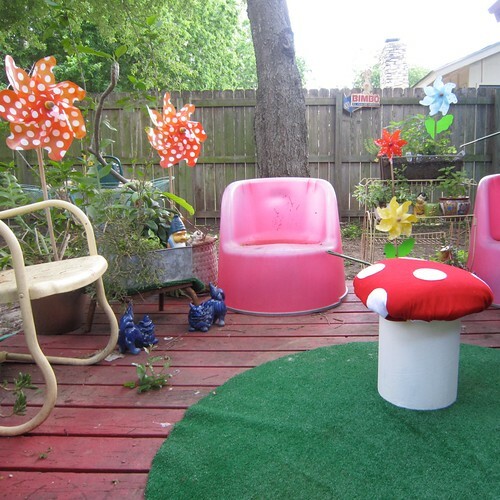 Love the toad stool!! My daughter had to make a stool for girl scouts using a similar idea. 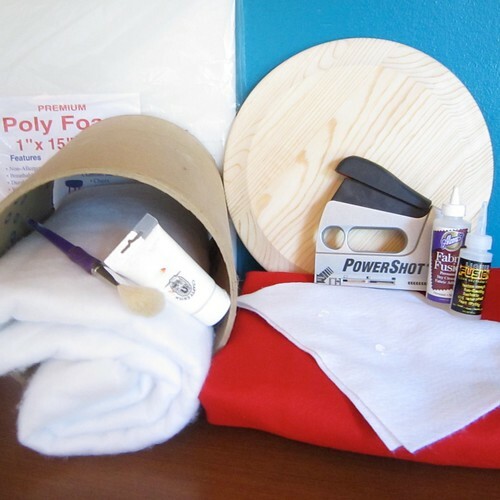 Hers was not decorative like the one you made though…it was just to sit on at camp. The baby…Oh my she is so cute! I have been watching her grow up on your blogs. She is really adorable! wow wow and super wow!! i like the pacifier… hahahha..
the pink chairs and that mushroom-like table..it's like a little garden for midgets..how cute.. hey aren't they bioplast where can i get this delivered to my place in one day?? 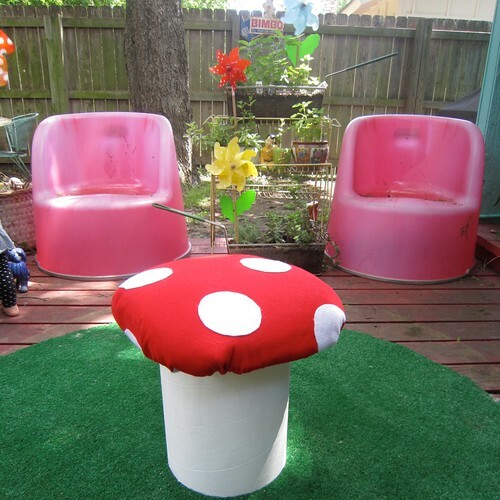 Hey Deb I saw this mushroom stool conversion on Apartment Therapy and thought of you. What if that is YOUR old stool. Dena what a fun camp project! Hi — I know this is an older post, but where did you get the wooden disc? Ya know it is so old I’m not sure I remember. Hobby Lobby has a big wood craft section. My guess is they would have something that works.